I sometimes enjoy Christopher Buckley's work more or less (usually less), but there's no doubt that he proved himself a class act in the public glare this week, coolly explaining how he found himself unwanted at the National Review, the magazine his father founded, after daring to present the conservative case for voting Obama. The National Review certainly got the worst of this exchange, and a quick look at their own rhetoric on Barack Obama proves that this magazine has ranged far from William F. Buckley's level of taste and respectability. Meanwhile, Christopher Buckley appears in this weekend's New York Times Book Review with a joint examination of two memoirs by reborn Catholics, Crossbearer: A Memoir of Faith by Joe Eszterhas and Called Out of Darkness: A Spiritual Confession by Anne Rice. Buckley, often a blunt humorist, is at his most sophisticated and measured here. He even reaches for his father's cadences with cutters like (speaking of Eszterhaus) "The man is one bubble off plumb, and yet you can't help liking him." He calls Anne Rice's hometown Berkeley, California the "Vatican City of atheism", which is funny but probably false -- some of those hippie professors are pretty spiritual, and this generalization is the kind of thing Christopher Buckley needs to work harder to avoid. There are ups and downs here, but a well-chosen John Lennon quote closes the genial and informative piece, and I think every reader will feel glad to know that Christopher Buckley has a home at the NYTBR, even if not at the National Review. Vintage beatnik-era cartoonist Jules Feiffer (subject of a recent LitKicks post) is a welcome surprise on the cover of this weekend's Book Review. Explainers is Gary Groth's new retrospective of Feiffer's early Village Voice cartoons, and David Kamp provides a useful if workmanlike summary of this wonderful artist's long career. 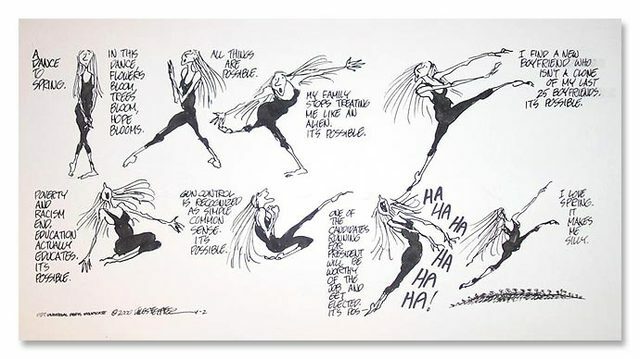 I have a few minor and highly subjective quibbles: Kamp describes many recurring Feiffer characters but doesn't mention Feiffer's great dancer (posted here), and he doesn't mention the children's book that was my own first encounter with Feiffer's artwork: Norton Juster's The Phantom Tollbooth. Also, the 1971 film Carnal Knowledge, which Feiffer wrote, is hadly the "blowsy, date-stamped" failure claims it to be. Mike Nichols hasn't directed a blowsy or date-stamped movie in his life, and the casting of Jack Nicholson, Art Garfunkel, Candice Bergen, Rita Moreno and Ann-Margret didn't hurt this picture either. I highly recommend this film, a caustic, Updikean look at modern sexual practices, and I don't know what Kamp could have found wrong with it. Small complaints aside, though, Kamp's piece is worthy of its subject, and I hope the new Jules Feiffer book is a success. I'm sure it will be an evergreen. Jennifer Egan's enthusiastic review of Jim Harrison's The English Major is the best piece in today's Book Review. Egan opens with lavish praise for the author's career output -- Harrison's sentences "fuse on the page with a power and blunt beauty whose mechanics are difficult to trace even when you look closely" -- and then justifies the praise by painting such an appealing picture of the new novel that I want to begin reading it right away. I like the way the title of Ottavio Cappelani's Sicilian Tragedee looks on the page, and David Leavitt provides a rapt explanation of this theatrical novel, which I also plan to check out. I haven't kept up with new Irvine Welsh novels in a while, but I'm glad to read Nathaniel Rich's summary of Welsh's new Crime. Other reviews don't light the same fire, and many leave me cold. John Freeman's introduction to The Given Day by Dennis Lehane fails to raise the slightest tremor of interest. Alison Light has written a book called Mrs. Woolf and the Servants: An Intimate History of Domestic Life in Bloomsbury and Claire Messud has sensitively reviewed it, but despite an eager start I find the article as painful as an eight-hour marathon of House and Garden Network reality shows to suffer through. I thought I wanted to know all about Virginia Woolf's household staff, but by the end of this piece I realize I don't. This weekend's endpaper puts me in a bit of agony, because there are few current critics I dislike more than Lee Siegel, and not just for his sloppy books about internet culture but also because he writes with a baroque self-importance that just irks me. I can't quite put my finger on it -- earlier this year, at a New York Public Library panel discussion, I tried to question him from the audience and found myself uncharacteristically tongue-tied. Woody Allen said it best: there are some people you just want to pinch. So let's just say I had to struggle a bit to achieve an open mind as I began Lee Siegel's essay "Unsafe At Any Read", a humor piece about whether or not anguished modern literary classics by the likes of Dostoevsky and Saul Bellow can help your life. Siegel conjures up some good literary touchpoints including Kafka, D. H. Lawrence, Don Quixote, Camus, Plato, Spinoza and Herzog, reveals that he was in an experimental "enriched" academic program as a small child (maybe this is the root of the personality problem), and unintentionally reveals that he remains clueless about the internet when he mentions meeting an old friend on Classmates.com (that was big in 2002, Siegel -- we use these things called Facebook and Twitter now). All in all, once you add up the clumsy jokes, mawkish personal asides and lame generalizations (Dostoevsky's Notes From Underground, as Siegel tells it, has no value beyond adolescence), this is mostly a lousy piece. I'm glad the New York Times Book Review is giving Christopher Buckley safe refuge. But maybe the National Review wants to take Lee Siegel off our hands. This article is part of the series Reviewing the New York Times Book Review. The next post in the series is Reviewing the Review: October 26 2008. The previous post in the series is Reviewing the Review: October 12 2008. 11 Responses to "Reviewing the Review: October 19 2008"
That's great news about Christopher Buckley. He does his father proud! Can't vote for the great unwashed. I mean Obama is a Harvard man. Elites of left or right disdain the non-rich non-elite. Anybody remember what this gag is from? Ape-man visitor is put before food, set with plate and silverware. "If he eats with this left hand he's a Harvard man, if he eats with his right hand he's Princeton", says rich Ivy league elitist snob. Ape man then grabs plate and eats with mouth. "Good heavens!!" shouts the elitist millionaire, "a Yale man". Vote for Obama because he's Ivy League. Plus ca change meme chose is the greatest saying of all time. Anyone who actually looks to the internet for literature knows that this week’s big story is the death of lit zine Zygote In My Coffee. Yeah, they finally published one of my stories, and that’s probably what killed them. To me, this is quite a sad loss. But just to see if I’m all alone here, lemme ask - which is your favorite internet literary zine, or don’t you bother with that kinda nonsense? So Mike, you shut it down? I think the name was a bit too creepy. Just kidding -- why did it close down? I'll read your story later. I see this as having lasted 5 years -- that is not bad at all. So that's the context I say what's next in. I can’t speak for Zygote, but I would like to speak to the small press in general. Re-Melanie Safka - you don’t know what you’ve got ‘til it’s gone. To publish a lit zine, to publish books, is a great honor, a great opportunity. If we all live in cyber space, then this is life. Granted, it’s not real life, your spouse, children, friends and relatives, are your real life. That’s who we are. But after that, comes what we do. Asher and Gallix, Markos Zuniga and others, are the kings of this realm. They direct and focus our interests, basically telling us what to think, what to do. You mention Chris Buckley, whose father, Bill, could tell a nation to elect Richard Nixon or Ronald Reagan. In error, obviously, but still the capacity to shape the world. So I say to Asher and Gallix, Koweski, and others, don’t go there lightly. If you’re gonna leave footprints, make them deep, solid, forever. So that all generations will walk in those marks. Believe me, Mike, I am trying to leave those footprints! By the way, though, it's not Melanie Safka but Joni Mitchell who you're trying to quote. Close. Wow, Brian Fugett featured a bunch of my stuff on ZygoteInMyCoffee way back in the day. I even won a "Zygote" coffee cup in the "worst poem" contest (the idea was to try to write bad poetry on purpose). I'll have to email Brian and see what's up. Bad poetry on the 'net? How remarkable! You might enjoy this Mr. Media podcast interview with cartoonist Jules Feiffer, who talks about the new collection of his comic strips from the Village Voice, Explainers, getting his start with Will Eisner on The Spirit, his plays (Little Murders), his movies (Carnal Knowledge, Popeye), the Disney musical adaptation of The Man in the Ceiling, and his forthcoming memoirs. I thought I would find more comments on Lee Siegel's essay--I'm glad I found yours. Siegel got a Ph.D. in tangled thought. I found his essay to ignorant and disingenuous. How irresponsible of him to be so dismissive of work by writers who are struggling to examine themselves and certain elements in life. This is the first essay by him that I've ever read, and he certainly has established low credibility with me. The surprising full life story of Hunter S. Thompson: novelist, journalist, American. Spurred on by urgent purpose, George Orwell (the pen name of Eric Arthur Blair) began writing the first of two books for which he is most famous, Animal Farm, at the end of 1943 at a critical point during World War Two. The performer is no longer the object of the spectator, but rather her/his confessor. The spectator's emotional response should be induced by a confrontational, violent experience. A walk through Art Spiegelman's childhood neighborhood, Rego Park, Queens, where his modest "Maus House" and a familiar creepy-looking subway entrance can still be found. E. Howard Hunt, pulp novelist and key Watergate operative, has died. Levi Asher explains why he considers Walden by Henry David Thoreau the greatest of all American books. To the barricades! A brief revival of a revolutionary spirit shook Paris, France and the entire world in 1968. Slavoj Zizek, a furry and fiery "rockstar philosopher" from Slovenia who calls himself a Communist and rages at the hypocrisy of wealthy American liberals, appeared in a raucous debate at the New York Public Library last night. Zizek's opposite partner was French activist and intellectual Bernard-Henri Levy, who typically argues for idealistic solutions and pragmatic steps towards a more peaceful world. The idea, found in Plato's Republic, that each human being is a government resonates with many other psychological or spiritual models and ideologies. Jesus may have been thinking of something similar when he said "You are the light of the world. A city set on a hill cannot be hidden." Or, in Buddhist cosmology, one might say that the invididual desires that bedevil a confused person are like "citizens" that must be made peace with. An enlightened person governs his owns needs, goals and ideas with wisdom and care. From a classic Mad Magazine comic, here are the great Harvey Kurtzman and Jack Davis riffing on what happens when a book gets turned into a movie. One thing you have to say for 'Little Brother', Cory Doctorow's recent book for young adults (now nominated for the Hugo Award for best novel): it's ambitious. "... a boyish, flop-haired moppet strides well-booted onto the stage of Cooper Union’s Great Hall."